Just in case you had not heard, SPB Wallet has been released for Windows Mobile devices. Here at mspoweruser.com, we wanted to make sure you had easy access to the press release, so here you are. The new Spb Wallet 2.0 â€” a secure repository of most valuable private information, such as PINs, passwords, keys, account, passport, and credit card numbers â€” has versions for non- and touchscreen Windows Mobile devices, Symbian Series 60 smartphones (including Nokia 5800 touch screen), Apple’s iPhone and iPod, and a desktop component. The new multiplatform approach allows users of Spb Wallet to keep their private data safe, even when they swap phones or mobile platforms. Spb Wallet securely stores sensitive information AES 256-encrypted and password-protected, supports automatic lockup, clipboard cleanup, and protects from phishing. The data can be synchronized between (and accessed from) multiple PCs and mobile devices. The virtual, electronically stored items, such as cards and passports look like real ones: Spb Wallet 2.0 offers an integrated online database of over seven thousand most popular cards, and the option to order more custom images â€” for free. The new Wallet 2.0 for Windows Mobile boasts Autocomplete for PIE, new finger-friendly UI, adaptive skins, smart scrolling, gestures, animation effects, and a new logon panel. The desktop version offers advanced integration with web browsers, automatic supply and capture of websites login information, password generator, migration wizard from custom CSV formats and other wallet applications. 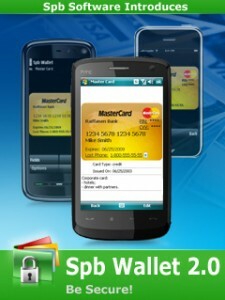 Spb Wallet is compatible with Windows Mobile 5.0 and Windows Desktop (2000, 2003, XP, Vista). A free, 15-day trial can be downloaded, or Spb Wallet for Windows Mobile may be purchased for 29.95 USD from www.spbsoftwarehouse.com. To be alerted of the latest Spb Wallet upgrades and availability please sign up to the product newsletter: http://www.spbsoftwarehouse.com/support/updates.html. As a limited time offer, users of Spb Wallet 2.x for Windows Mobile get the Symbian version for free, and vice-versa, please contact Spb Software support for details. According to Spb Software upgrades policy, all Spb Wallet 1.x users, who have purchased the product within the last 90 days, are invited to exchange the previous version of software for the newly released one, for free. So there you have it folks. To grab the trial version or to pick up a full version, or to read the original press release,Â head here. If you have been awaiting this program or have already been using it, let us know how it is going in the comments.